The Nokia 9 PureView is a beautiful phone from HMD Global that aims high with its unique imaging features. The five-camera array developed with Light and Zeiss was perhaps too ambitious, as the camera app on our review unit performed poorly and the resulting images didn't quite meet expectations. Practically everything else is great and HMD says the Nokia 9 will only get better over time. HMD Global has a lot riding on the success of the Nokia 9 PureView. As the company’s most high-profile launch yet, it’s nothing short of Nokia’s good name hanging in the balance. The Nokia 9 PureView targets the strengths of HMD Global’s competitors — photography — with a five-camera configuration developed in partnership with Zeiss and Light. The 9 mates this advanced camera with a modern, high-quality chassis and undercuts the iPhone, Pixel, and Galaxy phones on price. The Nokia 9 blurs the already hazy line between affordable and full-priced flagships. Can HMD Global play with the big boys? Those who don’t necessarily have a grand to drop on a smartphone may be able to save a few bucks with the Nokia 9 PureView, but serious software bugs threaten to negate the value equation. Can HMD Global play with the big boys? Android Authority is here to find out in its Nokia 9 PureView review. About our Nokia 9 PureView review: We used a Nokia 9 PureView for seven days in and around New York City on AT&T’s network. The phone was running pre-release software for several days before it received a Day One update from HMD (build 00WW_4_19A). Our Nokia 9 PureView review unit was furnished by HMD Global. *May be improved via update. The Nokia 9 PureView is wading into a crowded market. 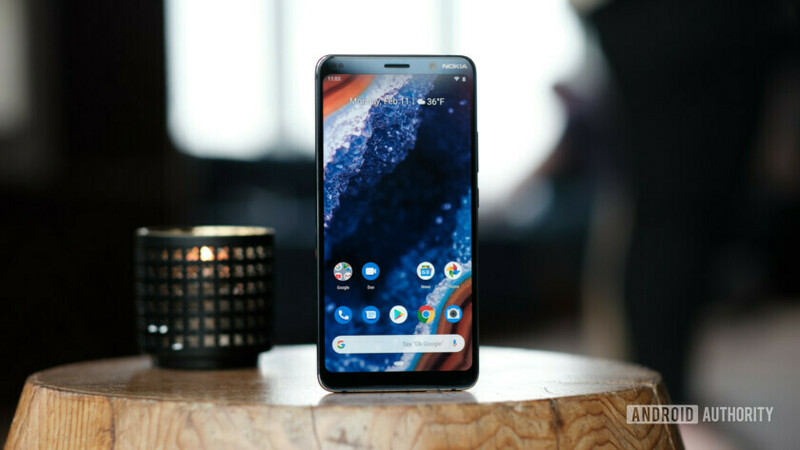 HMD Global’s previous efforts, such as the Nokia 3.1 Plus or Nokia 7, have been aimed at budget and mid-range buyers. The Nokia 9 goes straight for the high-end enthusiast who places significant value on design and camera performance. HMD clearly believes it has cut its teeth in the entry-level and mid-range markets. While those were good starting points for the company, bringing the Nokia brand to the flagship category is absolutely necessary. The Nokia 9 PureView is a clear step up from HMD devices such as the Nokia 7 and Nokia 8 series, allowing the 9 to stand atop the Nokia roster. At $699, the Nokia 9 PureView falls smartly under the $750 to $999 pricing of competing devices. This may give it the edge it needs to find its way into consumer pockets. As expected, the design and build quality are excellent. HMD opted for 6000-series aluminum and gave the metal frame an anodized finish. A glossy coat of varnish and exposed, chamfered edges complete the frame’s modern look. I like that the buttons on the right edge have their own polished chamfers, which catch the light as you move the phone around. Gorilla Glass 5 from Corning covers the front and the rear. Where the phone’s face is essentially flat, the back has a distinct curve near the side edges. The camera array is flush with the glass (something more phones need to accomplish.) Speaking of which, the Light-designed camera system looks more like the eye of a spider than a traditional camera. I hope you’re not arachnophobic. HMD went with an appealing deep blue color for the glass. There are no other colors available. The Nokia 9’s overall shape is standard fare, and it’s a sizable piece of hardware to hold and use. The phone isn’t Note-sized big; its footprint is closer to a Pixel 3 XL or OnePlus 6T. The glossy glass finish means the 9 is incredibly slippery. Despite the hardened Gorilla Glass 5, I’d get a case if possible. If you choose to skip the case, you’ll need to come to terms with the insane layer of fingerprint grime that quickly mars the glass. The Nokia 9’s hardware is excellent, but just short of superb. The Nokia 9 doesn’t come across as robust as a Galaxy S10, but it has more personality than a Pixel 3 XL. To my eyes and hands, it’s more on par with the likes of the LG G8 ThinQ in terms of quality. That is to say: the Nokia 9’s hardware is excellent, but just short of superb. Last, let’s talk about the fingerprint reader. Oh, boy. Putting fingerprint sensors under the display glass is the latest trend in flagship design and it needs to die in a fire. We’re clearly stuck in the growing pains of v1.0 tech. The fingerprint readers on the OnePlus 6T, Huawei Mate 20 Pro, and Galaxy S10 are uneven at best. Unfortunately, HMD Global has found a new low. Of all the under-the-glass fingerprint readers I’ve tested, the Nokia 9 PureView’s is by far the worst. Training it is no problem, but the reader just won’t recognize your print after a half-dozen attempts. The worst part is the phone constantly asks you to press the display harder and harder. I practically broke the Gorilla Glass trying to get the phone to unlock. As it is today, the under-the-display fingerprint reader is essentially unusable. If you buy this phone, you’ll do well to ignore it altogether and stick to a pattern, PIN, or password until a system update comes along. Speaking of which, HMD says a software fix is in fact in the works, but there’s no word on when it might arrive. We trust the fingerprint reader will be improved down the road. The Nokia 9’s display is one of its strongest features. Nokia calls it a PureDisplay. The large pOLED panel has a sharp look to it that I genuinely like. The high pixel count lends a crisp tightness to on-screen elements that makes icons pop and text stand out. Color is excellent. The pixels aren’t pushed as they are on some Samsung OLED displays and this gives the screen a more natural look. Owners can select from vivid, cinema, and basic color profiles, or set the phone to dynamic (meaning the color profile changes based on the ambient light.) Whites look white; there’s no blue or yellow tint. Viewing angles are quite good. My biggest gripe is the auto brightness tool. The screen pushed out plenty of light, more than enough so the screen can be used outdoors. The problem is the software. Built into the Android 9 Pie platform, the brightness control is too aggressive. It’ll drop brightness down to almost nothing when you’re in dark spaces, and continuously dial the brightness up and down as you move around light sources, such as lamps in your house. This is maddening. Worse, the auto control never cranked the brightness up enough when I took the phone outdoors. I had to turn off the auto brightness tool and adjust it manually as needed. Otherwise, it’s a fine display. The 845 has valiantly powered the best phones of the last year. Qualcomm’s SoC is the beating heart of flagships such as the Galaxy S9, Xperia XZ3, OnePlus 6T, and Pixel 3. On benchmarks such as GeekBench, AnTuTu, and 3DMark, you’ll see that the Nokia 9 does well. In fact, it scored significantly higher than the Galaxy Note 9. That’s impressive. The reality of using the Nokia 9 doesn’t quite live up to these scores, however, and I blame the current software. Even after HMD Global pushed a major system update, the Nokia 9 runs somewhat poorly — not all the time, mind you, but often enough to notice. Apps sometimes hang or crash completely. Some apps take too long to open, while others pop open in a blink. The camera, in particular, suffers consistently. HMD needs to clean up its code a bit, lest its flagship — which, let’s face it, has the specs of a 2018 phone — fall behind. After a week of testing, I found the Nokia 9 could hold its own with respect to battery life. It easily took me from 6am to midnight with power to spare. I was nervous that the 3,320 battery, which is a bit smaller than the batteries in some competing phones, wouldn’t go the distance. It did well enough. As always, software is here to help. The excellent battery optimizer that’s part of Android 9 Pie, called Adaptive Battery, does a commendable job maintaining a charge during the day. If I’m to complain about anything, it’s charging times. The phone simply takes too long to charge, particularly via Qi wireless chargers. Phones such as the Note 9 and Mate 20 Pro charge significantly quicker when used with the same Qi charger. The Nokia 9 PureView’s five-camera array should be its main selling point. It’s an ambitious attempt to stand far apart from the likes of the three-camera LG V40 and Samsung Galaxy S10. It stands apart, alright, but not necessarily for the right reasons. By invoking the “PureView” branding, HMD Global is hoping to capitalize a bit on the well-received Nokia 808 and Lumia 1020 phones from days past. The 1020, in particular, was hailed for its massive 41-megapixel sensor. Nokia (when it was an independent company) used the PureView tag to mark its most advanced cameras. The Nokia 9’s camera is truly advanced, but drops the notion of one over-sized sensor for five standard sensors. Was this the right move? HMD worked with Light (the company responsible for the L16 camera), Qualcomm, and Carl Zeiss to make this penta-cam work. Two of the sensors snap full color images, while the other three snap monochrome images for contrast, depth, and exposure data. HMD says the monochrome sensors each capture 2.9 times the light of the full-color sensors and together can bring nearly 10x more exposure data to the equation. The five cameras all operate in unison, rather than one or two at a time. The primary goal of this setup, it seems, is to make the Nokia 9 the Portrait Master of phones. Here’s how. The Nokia 9’s penta-cam is able to capture 12 times the depth data of a standard dual-camera phone. To achieve this depth, owners have to turn on the depth-capture function (in the left-side menu.) This depth, contrast, and exposure data is then passed through the Snapdragon 845’s image signal processor, which has been tuned by Light. The Light L16 Lux Capacitor chip also helps with the number crunching. This is often referred to as computational photography. Photos taken with the depth effect on are saved as jpegs and can be edited in Google Photos. Using Photos, you can tap into a depth-control slider to adjust the focal plane to create the depth effect you want. Given the sheer amount of depth data available, Nokia 9 owners have far more control over the bokeh/portrait effect. Thus, making the phone the Portrait Master. The Nokia 9 can also capture RAW images for those who prefer to to do their own editing. Further, the Nokia 9 includes the free version of Lightroom CC, With the current software build, Lightroom runs rather poorly on the phone. The glass is all from Carl Zeiss. The Zeiss optics have been tuned specially for the penta-cam arrangement. The Nokia brand has had a long association with the Zeiss brand when it comes to camera lenses. The camera app stumbles badly. I hate to say it, but the camera app itself stumbles badly. I’m talking the performance of the app itself. It’s painfully slow to open, like two to five seconds slow. I easily missed shots of my kids playing basketball because the camera app couldn’t get its act together. The pain continues after the app is open. Like many camera apps, you can switch between shooting modes (photo, video, bokeh, time-lapse) by swiping the viewfinder from side to side. The process of doing this on the Nokia 9 is infuriatingly pokey. The app can also crash and freeze. The camera app simply gave up and died at least a half dozen times. HMD Global told Android Authority that it is preparing a system update specifically to address camera performance issues. The company did not say when the software will become available. When that software update is provided, we’ll update our review accordingly. Tons of features and options are on board. You have full control over the flash, timer, beauty mode, depth, live motion, and Google Lens. You can change the resolution and aspect ratio, manage GPS tagging, and much more. The Pro shooting mode gives you manual control over white balance, exposure, aperture, and shutter speed. Knowledgeable photographers can put these to more creative use. The layout of the camera app is a bit cluttered, but it’s manageable. I simply wish it were faster at everything. The photos should speak for themselves. They are often spectacular, and yet also not. You can see amazing clarity in some of the shots below, such as the silver elephant and subway tiles. But then you see the lack of focus and grain in the basketball and night waterfall shots. I was truly expecting low-light photos to be much better, given the three monochrome sensors. White balance is all over the map. You can see a strong yellow tint in a number of the photos captured indoors. Other phones suffer from some of these same issues. Considering the four-way partnership between HMD, Qualcomm, Light, and Zeiss, I had high expectations. Sadly, those expectations have not quite been met. Let’s not forget video. The Nokia 9 can capture video up to 4K resolution on the rear and the front. Only the central lens is used to capture video, rather than the entire penta-camera array. The video I shot generally looked good. We’ve created a gallery of full-resolution photo samples taken with the Nokia 9 PureView here. HMD Global has taken a respectable stance on software. The phone ships with Android 9 Pie One Edition. This means it’s a clean build of Android. Moreover, HMD has committed to providing system updates for two years and security updates for three years. Android 9 Pie is Google’s best, but there is still room for improvement. The home screen experience is simple enough and managing aspects such as shortcuts and widgets is no problem. The pill-based UI nav tool (visible at the bottom of the screen) takes some getting used to. Opening the app drawer remains a bit frustrating, as it requires a long pull upward. Fast-swiping the pill to jump between open apps is not the most intuitive action in the world. Despite these usability gaps, the settings system works well. It’s neat and organized, and the ever-present search bar ensures you’ll find what you need in a hurry. The app drawer presents app and action suggestions at the top, followed by all your apps in alphabetical order. I do wish the native Android app drawer supported folders. 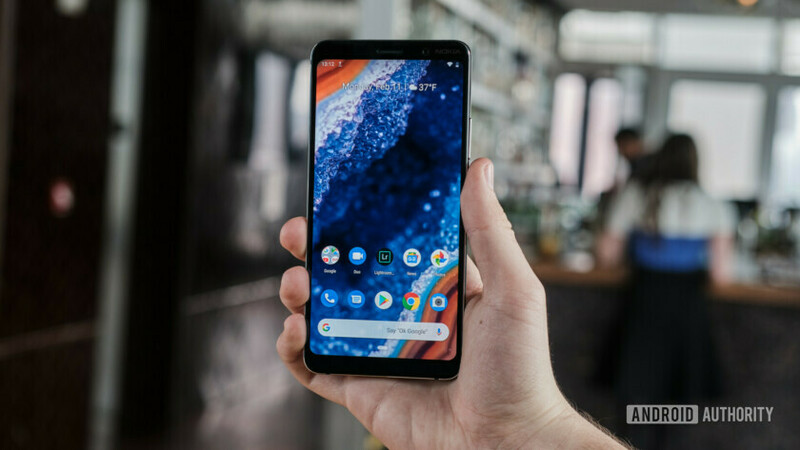 Other strong points include a highly-customizable ambient display, fine-tunable notifications, and seamless integration with the wider Google ecosystem. If you’re not the biggest fan of Pie, you can always install your own launcher. There’s no bloatware, which I truly appreciate. I’ve come to expect stereo speakers on modern flagships. The Nokia 9 doesn’t include them, though the bottom-firing speaker does sound good. Watching video without headphones simply means you get sound firing off to one side or the other. The phone does not have a 3.5mm headphone jack, though it does support USB-C audio. Rather than ship the phone with USB-C headphones, HMD packaged the device with standard 3.5mm headphones and included a 3.5mm-to-USB-C adapter. That’s just absurd. Why not simply include USB-C headphones? The included buds are pretty cheap and don’t sound all that good. If you really want to enjoy your music, your best bet is Bluetooth. The aptX profile means you get high-quality audio via Bluetooth as long as your headphones also support it. Phone calls sound crystal clear. When HMD Global first showed me the Nokia 9 PureView, I instantly fell in love. The phone looks great, feels great, has an excellent display, and covers all the basics in terms of high-end features. You’ll find an attractive metal-and-glass body with plenty of storage, water resistance, wireless charging, and a clean version of Android. These are all good things. The fingerprint reader is simply not up to par. The under-the-glass fingerprint reader is a bummer. It’s simply not up to par as-is. HMD will get around to improving it via software at some point. The five-camera array on the back, designed with Light and Zeiss, holds a lot of potential though the performance of the camera software is uneven at best. HMD says this will be fixed down the road. Photos are often brilliant and also sometimes mediocre. While I appreciate the depth and power of the bokeh effect, I’d rather have wide-angle and telephoto lenses available on my phone. These would allow me to capture a broader array of photos types in different spaces — much like the Samsung Galaxy S10, Mate 20 Pro, P30 Pro, and others. The Nokia PureView’s $699 price point is right where it needs to be to compete with iPhones and Galaxies, as it undercuts them a bit. Once the Nokia 9 is at the top of its game, I would call it a great competitor to the OnePlus 6T or LG G8. Flagships such as the Galaxy S10 or Mate 20 offer a little more pizzazz and better performance, if you don’t mind the difference in cost and more heavily customized software from Samsung or Huawei. I would recommend the Nokia 9 PureView to Nokia fans and photography fanatics with the caveat that the fingerprint reader and camera app aren’t operating at 100% just yet. After HMD Global provides the promised update, we will revisit our review as needed to make the proper adjustments. Thoughts on our Nokia 9 PureView review and the phone?